Click on the photo. 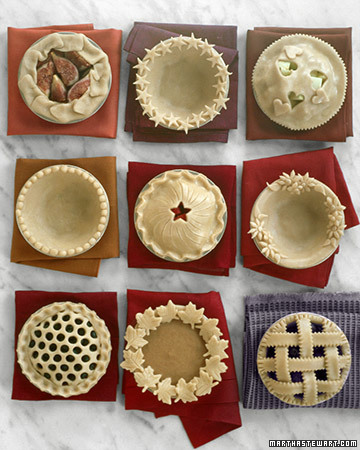 Lets talk PIE CRUST. Proper title to the blog. It is often said that people taste more with their eyes than their mouths. So, if you are able to make prettier pies with canned dough…I suppose can wins. Personally, I love the long process of making pies. The mixing of dough, the settling, the rolling…etc. I am truly torn! I always thought homemade was the ONLY way to go, until my dad, who was a pastry chef SWORE the Pillsbury (NO other brand is good!) Rolled crusts were the way to go. I guess I understand, in a way, because while I might enjoy the process of making a perfect pie, if I had to make 100 everyday, it might change my process a bit! And, I mean, what baker makes their own, say, puffed pastry these days….? Or fondant…? I’m unbiased. I really love both! Well, I like the recommendation in your blog, because it makes making a pie more accessible. Not that making the dough is a terrible challenge, but its a step above your average drop cookie. So, it opens the door for someone who isnt that interested in all the steps, but wants a gorgeous pie (or is limited with time constraints). It also sure beats serving a frozen/grocery-store bought pie. But you wouldn’t be able to convince me on cake mix. Even if you try to mask it with additions, it still tastes like cake mix to me. go too excited, and forgot to sign in before i posted that last comment. A Train Car Birthday Party!